Dry Eye Syndrome, also known as keratoconjunctivitis sicca, is a common ocular condition that primarily affects the cornea and can result in a range of symptoms from mild ocular discomfort to loss of vision. Dry eye occurs when there is abnormality of the tear film. The tear film normally coats, lubricates, and protects the cornea. 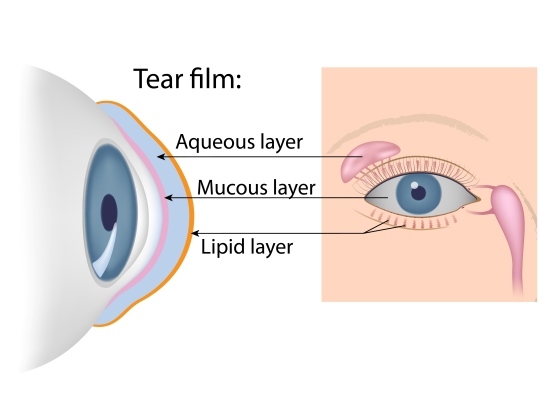 The tear film is composed primarily of an aqueous component, but also contains lipids and mucin to help prevent evaporation. Tears also contain antibodies to protect the eye against infection. The tear film may be abnormal as a result of a deficiency in any of its components, which can lead to evaporative loss. More recent evidence also suggests that inflammatory mediators in the tear film play an important role in dry eye syndrome. Symptoms of dry eyes include discomfort and irritation, tearing, light sensitivity, and loss of vision. Some systemic conditions such as Sjogren’s syndrome, rheumatoid arthritis, and collagen vascular diseases reduce the ability to make aqueous tears. Inflammatory lid conditions such as blepharitis and meibomitis may reduce the ability to make the lipid component of the tear film. Chemical eye injury may result in mucin deficiency of the tear film. Some systemic medications, such as antihistamines, can contribute to dry eye as well. Treatments for dry eyes include lubrication with artificial tears, punctal occlusion, and Restasis and other topical anti-inflammatory eye drops. Punctal plug placement may be performed to treat dry eyes. Temporary punctal occlusion is performed by placing a silicone plug into the punctum, which may help keep the eye moist. The punctum is the small opening found in the inner corner of each eyelid which drains tears into the nose. Placing a silicone plug into the punctum prevents tears from draining, which may help with dry eyes. This is a quick, painless in-office procedure. Our highly skilled Board-Certified Ophthalmologists and experienced Optometrists, along with our caring staff, are dedicated to preserving and improving your vision. It is our philosophy and belief that we take care of our patients like members of our own family. To schedule an appointment or for any eye related questions, contact us via telephone or email. © Copyright Quality Eye Center.